For over 25 years Pam has lived above 9000 feet surrounded by snow covered mountain peaks in Colorado. At 31 Pam’s first book, Cowboys Are My Weakness, was a success, granting her a small financial independence ($21,000) heretofore unknown to the young wordsmith, giving her the means to purchase a home (a novel concept to a young woman whose belongings fit in the trunk of her car). Remote, isolated, her 120 acre ranch is home to Pam in visceral ways. Deep Creek is the story of this woman’s bonding with the land, the way it heals and challenges her. 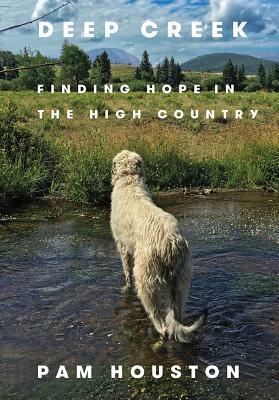 Beautifully written with courageous honesty, it shines with an appreciation for the wilderness and the creatures that also call this Rocky Mountain aerie home. The life of a rancher in the high country is full of hard work, dangerous weather, and care for the animals who depend on compassionate handling. Walking gently on the earth, caring about the wilderness are bone deep commitments to Pam that she encourages the reader to embrace. Sometimes funny, sometimes sad, always engrossing, this is an absolutely lovely celebration of a life well lived. A passionate respect for wilderness and a resolve to experience life with vigor shine throughout Deep Creek. There are hikes up into the high country, herd of Elk wandering through the meadows, the brilliant blaze of Aspens painting the fall days, and over all the embrace of dramatic 12000 feet snowcapped mountains. Pam travels, observing whales in the Northwest Inland Passage then meeting their migration in Hawaii. Her intense connection to the natural world and gift in writing clear, engaging prose give the reader an intimate account of why appreciating and valuing wilderness is important. Pam acquired animals. Two horses, Roany and Desco, have grown old on her ranch. Icelandic sheep (Wooly Nelson is major cute) make it a working ranch, chickens for eggs. A pair of rescued miniature donkeys, Simon and Isaac joined the crew. The donkeys are playful and mischievous; Isaac has an impressive Napoleon complex that leads him into trouble occasionally. She writes with humorous affection about their adventures. Ranches are hard work, there is hay to stack, wood needed for winter, animals to be fed, fences to be mended. Pam grows into her role of woman rancher; often in winter so isolated she is the only person in the snow covered landscape for miles. Fire season in recent years has grown, become more dangerous and destructive. In June 2013 fire found Pam’s mountains and she began to learn the jargon of firefighters. The account of that summer is intense; the tension as she watched fire devour trees, and eventually threaten her ranch will leave a lasting impression. Surviving childhood for Pam was not only emotionally scarring, it was downright dangerous. She is open and honest about the damage caused by her alcoholic, abusive parents. That she grew into such a kind, compassionate woman is a testament to her strength of character and will to survive. She celebrates the friendships that have enriched her life, pays tribute to the ranching community that welcomed her, and shows that she takes seriously the responsibility of being a good friend and community member. Deep Creek celebrates the land that gave Pam sanctuary and grounding, the land that brought her home. It is also a pure pleasure to read.